In the recent post on why changing oneself is so difficult, I drew on the work of Kegan and Lahey, who emphasize that our "competing commitments" can make us immune to change. They make the point that our "big assumptions"--our deeply-held beliefs about ourselves and the world--can stand in the way of implementing desired (and desirable) changes. If I hold a deeply held belief that everything I do is destined for failure, then it's understandable that part of me would hold back from taking risks even though another part of me wants to take a calculated leap. If my belief is that it is selfish to make money and focus on success, it's not surprising that I won't sustain the drive to achieve in business or in markets. Amazingly, Kegan points out, people can be told that they need to take pills or else risk death--and yet a majority won't comply with doctors' orders. That's not because they don't want to live. It's because a competing drive makes it difficult to change their behavior. I had the honor and pleasure this afternoon of speaking with a wise rabbi from Beth Medrash Govoha in Lakewood, NJ. BMG, if you don't know about it, is a very unusual place, where students gather to study in self-organized groups and select their leaders--a place where the entire goal is learning for learning's sake. The rabbi and I discussed change and he made an excellent point: You can look at an ideal behavior--or someone who is ideal--and that can be inspiring. But most of us are far from ideal and need to change one action at a time. If you want to be a more generous person, you start by doing one generous thing each day. No big change--just a step in the right direction. Now it turns out that this is how people overcome many forms of anxiety, such as phobias and PTSD. They very gradually, but very steadily, face the thing they are afraid of and build one successful experience after another. 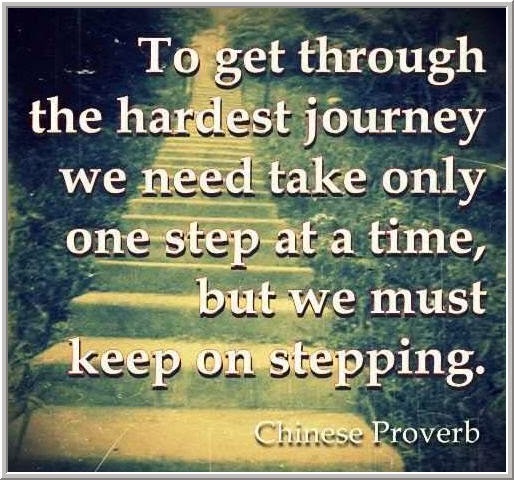 Each step is not a large one, but after a while people are facing things they could never have tolerated earlier. If you're not working on change daily, you're not working on change. And if you try to accomplish massive changes in one day, you run the risk of activating competing motivations and derailing your efforts. When change is each day in small ways, you gradually experience yourself in new ways...and soon that experience becomes part of your identity. Most people are not immune to change. They are immune to big changes. The key to remaking yourself is to find the small steps that add to big changes without setting off alarms.